The war with Japan cost Russia 2.5 billion rubles. After the war, the Siberian flotilla was left only with the cruisers Askold and Zhemchug, a gunboat and 13 torpedo destroyers. The Baltic fleet was likewise weakened, since its vessels were used to comprise squadrons for the Pacific Ocean theater. The Black Sea fleet was not affected by the Russo-Japanese War. It comprised eight battleships, two cruisers and four torpedo cruisers. The rebuilding of the Naval Forces remained one of the top priorities for Russia. In its fulfillment were involved the distinguished domestic shipbuilders A. N. Krylov, N. N. Kuteynikov, I. G. Bubnov and others. To aid the fleet, voluntary donations were advertised to the public. A “Committee for the strengthening of the fleet through voluntary donations” was instituted. Over five years the Committee collected a formidable sum of 17 million rubles. It was decided to use these funds to construct 20 torpedo destroyers of General Kondratenko and Ukraina classes. These formed the base of the new fleet. In 1913, a significant development took place in the evolution of the domestic torpedo vessel. On September 4, the Putilovsky plant in St. Petersburg delivered the flagship torpedo destroyer Novik to the fleet, bringing well-earned fame to Russian military shipbuilding. For several years the Novik was the fastest ship in the world (37.5 knots). The Novik project was created in accordance with the technical specifications developed by the Naval Engineering Committee, headed by A. N. Krylov, I. G. Bubnov and G. F. Shlezinger. Following the flagship, a series of ships were constructed with some elements of improvement. They were built by three plants in St. Petersburg, as well as plants in Reval, Riga and Nikolayev. By the beginning of World War I, all Russian fleets in combination had 75 destroyers of various types, plus 11 under construction. Moreover, the fleets also had 45 torpedo-boats of earlier designs. Between 1913 and 1917, the Baltic fleet acquired a total of 17 Novik class destroyers, and the Black Sea fleet got 14. The Japanese War experience demonstrated the importance of cruisers in squadron combat. The utmost necessity of maximizing their speed and maneuverability, as well as improving their artillery armament became clear. A subclass of battle cruisers began appearing in foreign fleets. In Russia, construction of such began only in 1913-1915, when the Izmail, the Kinburn, the Borodino, and the Navarin were begun, but the outbreak of the world war prevented their completion. 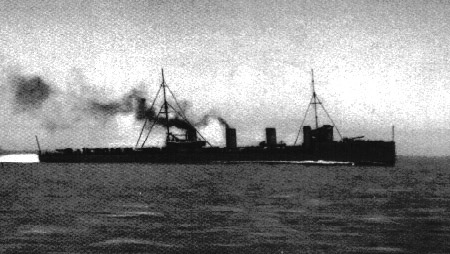 But immediately following the end of the Russo-Japanese War, domestic and foreign shipyards began constructing, for the Russian fleet, cruisers whose prototype was the Bayan, which had established a good reputation as a squadron cruiser, and had demonstrated a robustness of its combat and technical resources. Thus, the cruiser Admiral Makarov was built in France, the new Bayan and the Pallada, in St. Petersburg; the cruiser Ryurik, which was being built in England, differed from the cruiser Bayan in its main gun caliber (instead of two 203-mm cannons, it had four 254-mm weapons). In 1913, construction began on six light cruisers of the Svetlana class, with a displacement of 6800-7800 tonnes, armed with fifteen 130-mm weapons. Of these only three cruisers (the Svetlana, the Admiral Nahimov, and the Admiral Lazarev) were completed (in the Soviet era). By the beginning of the war, the Russian fleet comprised 14 cruisers of various types. England was the first to draw conclusions for itself from the Russian fleet’s defeat in the Battle of Tsushima, and especially from the circumstances and reasons surrounding the loss of battleships. Already at the end of 1905, English shipbuilders began construction on the original armored vessel the Dreadnought, with a displacement of 13,000 tonnes, equipped with steam turbines, classed as a battleship. Main-caliber artillery aboard the Dreadnought comprised ten 305-mm weapons, mounted in two-gun turrets. The battleship’s broadside could simultaneously include four turrets, controlled from one central post. The sides of the ship were completely armored. Russian dreadnought-battleships, which were constructed under a project of I. G. Bubnov's and with A. N. Krylov's collaboration, in many ways surpassed the English prototype. In 1909, the battleships Sevastopol, Gangut, Poltava and Petropavlovsk were begun in the shipyards of St. Petersburg. The linear alignment of twelve 305-mm weapons, arranged in three-gun turrets, allowed the simultaneous firing of all gun barrels on either side. 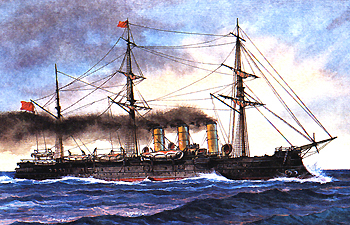 While the weight of a broadside from one of the first English dreadnoughts, the Vanguard, comprised 3003 kg, on the Sevastopol it reached 5650 kg. In one minute, the Russian battleship released up to 11.5 tonnes of metal and explosive materials. The main armor belt was 225 mm thick. For the Black Sea, the dreadnought-battleships Imperatritsa Mariya, Imperator Aleksandr III and Yekaterina II were also constructed in Nikolayev in 1915-1917. A fourth battleship, the Imperator Nikolay I, begun in 1915, was never completed. Russia’s Naval Ministry noted, in regard to battleship construction, that the results of testing the ships demonstrated the utmost readiness of our plants, which were building ships of such high displacement for the first time, as well as rather massive turbine mechanisms. The Dreadnougt class battleships Andrey Pervozvanny and Imperator Pavel I, begun during the Russo-Japanese War, entered the Baltic fleet in 1912. In the course of their construction, the original project was significantly modified to take into account the experiences of the Russo-Japanese War. The use of torpedo weaponry in the Russo-Japanese War, and its further development, forced the fleet to undertake effective measures to provide anti-torpedo defenses. To begin with, the fleet needed ships equipped with minesweeping technology. Such vessels were called for in the small shipbuilding program. The world's first specially designed minesweepers, the Minrep and the Vzryv, were begun at the Izhora plant in 1909. In line with tactical and technical requirements, the minesweepers had a displacement of 150 tonnes. The ships’ main equipment were Schulz trawls (water-kite and motor-boat). They also had one 57-mm weapon. The ships were commissioned in 1911. Before the first World War and during the war, trawlers of a somewhat larger displacement were constructed, of Klyuz (190 tonnes) and Kapsyul (248 tonnes) classes. In 1909-1910, two ships were commissioned that were specially designed for minelaying. These were the minelayers Amur and Yenisey, having a displacement of 2926 tonnes. They could carry 324 mines each. Their artillery included five 120-mm weapons and two 75-mm anti-aircraft weapons. For the Caspian and river flotillas, gunboats with a displacement of 400-600 tonnes and armed with 120-152-mm-caliber artillery were built. Submarine construction was also gathering momentum. The first battle sub, the Delfin, designed under I. G. Bubnov, was commissioned in 1904. I. G. Bubnov also designed the submarine Akula, which was built at the Baltic plant (1910). The submarine was armed with eight torpedo tubes. Following the Akula, the Russian fleet acquired submarines of the Kalmar class (through an American project), Minoga class (displacement of 123/150 tonnes) and Morzh class (displacement 630/790 tonnes). However the nucleus of Russia’s submarine fleet became the Bars class submarines – also designed by I. G. Bubnov. Their construction began in 1913-1914 in St. Petersburg and Reval. The surface displacement of the Bars was 650 tonnes, and the submerged displacement was 782 tonnes. Two diesel engines with a total power output of 3000 hp allowed the submarine to attain a velocity of 18 knots while surfaced, and it had a range of around 2250 miles. Submerged, the sub had a speed of up to 9.6 knots. Power was delivered by two electric motors with an output of 900 hp. This speed could be maintained under water for 25 miles. The working submergence depth was limited to 50 m, with a maximum depth of 100 m. The armament consisted of four torpedo tubes (two each fore and aft), and two cannons, of 57-mm and 37-mm calibers. A special place in domestic submarine shipbuilding is held by the world’s first submarine minelayer the Krab, designed by M. P. Naletov. The designs for its construction, begun by the engineer while still at Port Arthur, were interrupted by the Russo-Japanese War. But after the war, the work was resumed on the Nikolayev shipyards; in August of 1912 the submarine was released into water, and in June of 1915 it was commissioned into the Black Sea fleet. The Krab could carry 60 mines. Armaments included two fore torpedo bays and a 76-mm weapon. In July of 1915, the Krab made its first combat sortie. It deployed a minefield near Bosphorus that detonated the enemy ship Breslau. The Krab class minelayers Ersh and Forel were built for the Baltic fleet, and construction began on three minelayers of a smaller displacement. By the beginning of World War I, the Russian fleet had 15 combat submarines. The main naval theaters of combat activity for Russia during the first World War were the Baltic and Black Seas. From the beginning of the war, the Baltic fleet established the central minefield and artillery position of Nargen - Porkkala-Udd with the aim of preventing enemy incursion into the Gulf of Finland. The entrance to the Gulf of Riga was defended by another minefield and artillery position. Minefield deployments in the southern part of the Baltic Sea served to disrupt enemy maritime communications, and was a detriment to the German fleet. It was especially important to reduce the usability of the sea route used to transport strategic raw materials from Sweden to Germany. The minefields deployed by the Russians on the Baltic proved to be such an effective threat, that the Germans, having lost a great number of navy ships and transport vessels, for a long time after the end of 1914 refrained from conducting naval combat operations. In the course of World War I, the Baltic fleet deployed around 40 thousand mines. Another important objective for the fleet was the coordination with deployments of land-based troops on seaside flanks, which it was successfully achieving. In 1915, the Black Sea fleet was inferior in military strength to the Turkish fleet, which was reinforced with the German battle cruiser Geben and the cruiser Breslau. However, subsequently, supplemented with new battleships, it managed to block the German-Turkish fleet in Bosphorus and drastically reduce the enemy’s maritime transport activity. Operating on seaside flanks the Black Sea fleet provided significant support for the Army with artillery fire and landing forces, and provided transport for troops and equipment. Throughout the war its ships deployed over 13 thousand mines. In the course of World War I, the Russian fleet did not participate in massive naval battles like the Battle of Jutland. At the same time, individual formations and ships of the Baltic and Black Sea fleets had numerous military confrontations with the enemy (the battles at Cape Sarych and Gotland Island, the Moon Sound operation and others). Created in September of 1916, the North Arctic Ocean flotilla provided naval transportation with the allies, conducted operations against enemy submarines and mine threats. After the events of October, 1917, Russia exited the war. On March 3, 1918, a peace treaty was signed between Soviet Russia on the one side and Germany, Austro-Hungary, Turkey and Bulgaria on the other. According to the treaty, all Russian vessels were to be returned to Russian ports or be disarmed on the spot. Ships and vessels of the Baltic fleet that were located in Finland were to remain there until the start of navigation. This posed the threat of losing this naval theater's forces, which were mainly concentrated at Helsingfors. The leadership of Soviet Russia made the decision, despite the difficult ice conditions in the Gulf of Finland, to transfer all ships to Kronstadt. The legendary Ice voyage of the Baltic fleet ships occurred during the months of March and April of 1918. Russia salvaged 226 ships and other vessels, including 6 battleships, 5 cruisers, 59 destroyers and torpedo-boats, 12 submarines. Moreover, the vessels brought with them two Air Force brigades and various military equipment. In May of 1918, German command, threatening to break the Treaty of Brest, demanded that Russia give up its Black Sea fleet ships. To avoid doing so, in June of 1918 V. I. Lenin ordered the scuttling of ships in the Novorossiysk and Tuapse regions that had come from Sevastopol: the battleship Svobodnaya Rossiya (the former Yekaterina II), 11 destroyers and torpedo-boats, 6 transport vessels. With the beginning of the civil war and the foreign intervention, the revolution-minded sailors, junior commanders, officers and admirals of the fleet sided with the new regime, while the rest, mainly admirals and officers, sided with the White Army. The former commanding officer of the Black Sea fleet, Admiral A. V. Kolchak, declared himself the Supreme ruler of Russia in November of 1918, heading up the counter-revolutionary struggle in Siberia. Most of the ports and bases of the Russian fleet ended up in the hands of interventionists from nations of the Entente and Japan. The Russian Naval Forces practically ceased to exist. To support land forces, commands of the opposing sides in the civil war created river and lake flotillas, which conducted active campaigns. The flotillas would typically include gunboats converted from steamboats and armed with two to four 75-130-mm weapons, as well as armed tugboats, floating batteries, courier vessels and boats. In isolated instances the flotillas would be supplemented by ships transferred from fleets by interior water channels. The flotillas would strike the enemy flanks and from the rear, attack ships and other vessels, defend or destroy ferries, land assault forces, and provide shipping. After the ruin of the White Army of Lieutenant-General P. M. Vrangel in Crimea in 1920, the main contingent of the ships and other vessels of the Black Sea fleet (33 units) sailed to the French naval base of Bizerte (Tunisia) under the command of Vice-Admiral M. A. Kedrov. St. Andrew’s (Russian Naval) flags were lowered on these vessels on October 24, 1924, after the French government recognized the USSR. The Russian sailors were now refugees.